Fleas can transmit a variety of diseases to your cat. Flea collars are popular flea control options for cats because they are inexpensive and available over the counter. However, many environmental groups and veterinarians have raised concerns about the safety of these products, and other flea control options may be safer and more effective for your cat. Most flea collars work by releasing small quantities of insecticides that kill fleas, interfere with their ability to breed or both. An environmental group, the Natural Resources Defense Council, sued the manufacturers of several flea collars in 2009, stating that the collars contained unhealthy levels of the toxins propoxur and tetrachlorvinphos. Some flea collars contain diazinon, which was originally developed as a nerve gas, and which has been banned in flea collars in France. 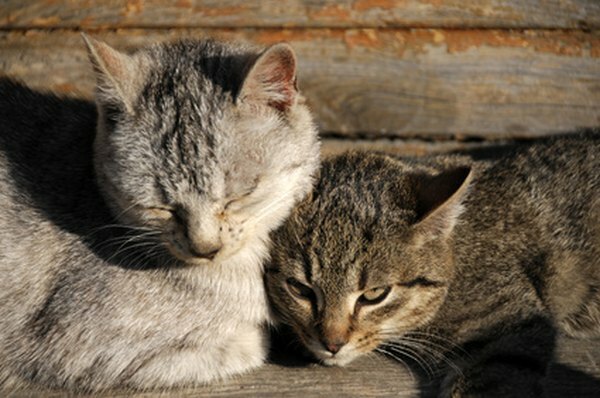 Flea collars containing insecticides may pose a poisoning hazard to cats and their owners. Because cats frequently lick and groom themselves, they are at risk of directly ingesting the toxins in the collar. The toxins may also be absorbed into the skin, resulting in skin irritation, loss of fur and allergic reactions. Natural flea collars contain ingredients such as rosemary and citronella. These ingredients may deter fleas via smell or poison fleas without posing a poisoning risk to cats. However, natural products are typically unregulated, and many of the ingredients have been untested. While natural flea collars are less likely to poison your cat, they may still pose some health risks. They may also be ineffective at eliminating fleas. Topical and oral flea treatments are highly effective at treating fleas. While these products are available in over-the-counter concentrations, prescription products are safer. Because these products must be prescribed by a veterinarian, the dosage will be appropriate for your cat's age, weight and any medical conditions your cat might have. While no product is completely safe, there are far fewer adverse reactions reported with prescription flea medications. If you notice skin irritation, fur chewing or that the fleas have not gone away after using a prescription medication, talk to your vet. He may test your cat for allergies or prescribe an alternative flea treatment. Dr. Pitcairn's New Complete Guide to Natural Health for Dogs and Cats; Richard Pitcairn et al. Are Dog Flea Collars Dangerous to Humans?